Navistar UAW Local 5010 represented employees at the IC Bus Plant in Tulsa, Oklahoma have ratified a new four-year collective bargaining agreement. The contract was approved by a majority of voting UAW members and replaces the prior contract that expired February 1, 2019 at 12:01 a.m. The contract represents about 700 workers at Navistar’s Tulsa Bus Plant. ​Last month, the teams at our Springfield Assembly Plant and Truck Specialty Center hosted more than 40 firefighters from eight local fire departments in Clark County, Ohio for truck extrication rescue training. The training took place in the Truck Specialty Center and two ProStars were donated by Navistar for the training. Navistar has donated trucks for similar trainings near our Melrose Park facility, but this was the first time it was done in Springfield. “I’m a former firefighter, so when I saw the article about the Melrose Park extrication training, I thought we have two engineering trucks that have been sitting here in Springfield that we should be using for a similar cause – otherwise they will get scrapped,” said Rusty Sindle, senior security consultant, Global Security. Rusty explained that for all the firefighters in attendance this was the first time they were able to work on a truck. They also had 12 cars at the training that were donated by a local towing and recovery company. The company donated services to move and haul directly to a shredder afterwards as well. During the 12-hour training, the firefighters learned several extrication techniques such as how to pop doors, roll dashes, lifting and stabilization and penetrating cabs to access passengers. The tools used for training were the exact tools that are available in an emergency response situation including bars, saws, rams, cutters, spreaders, chisels and heavy hydraulics. They used the newest battery-operated extrication tools at the training, which were loaned out by the top three tool manufacturers. In addition, two specialized extrication instructors were in attendance to lead the class and make sure the firefighters got the most out of the opportunity. Navistar and the UAW Local 5010 at the IC Bus Plant in Tulsa, Oklahoma have reached a tentative four-year collective bargaining agreement. The ratification vote will take place on Friday, February 8. About 700 workers at Navistar’s Tulsa Bus Plant are represented by the contract. Navistar UAW-represented employees have ratified a new six-year collective bargaining agreement. This replaces the prior contract that expired on October 1, 2018. The contract includes employees at the Springfield, Ohio assembly plant, Melrose Park, Illinois facility and Parts Distribution Centers in Atlanta, Dallas and York, Pennsylvania. Imagine that you are on the plant floor building one of Navistar’s trucks. The truck comes into your station, but then you realize that not all the parts you need are available. What do you do? You must “call for help” or “pull the Andon cord.” This activates the help chain and a team member or supervisor will soon get the parts you need. Now, instead imagine that you are on the line and your supervisor gets an alert that the parts are low in your station. They deliver the parts you need before you pull the Andon cord. First time quality is immediately improved, and you are well on your way to making a higher quality truck more efficiently. This is the new lean process that Navistar is hoping to achieve through improved data analytics in each of our manufacturing plants. “Providing real-time data allows us to predict effectiveness and give the operator the information they need to build trucks,” said Mark Hernandez, senior vice president, Global Manufacturing. “Digital also helps processes work faster – world class processes equal world class quality,” he added. The Manufacturing IT and Analytics teams recently participated in a data analytics workshop at the Springfield Assembly Plant to talk about real-time data collection and a new software pilot that will be launching in February. The software will help plant managers visualize the health of the assembly line in real-time. It will also allow plant employees to focus on quality assurance versus quality control. Navistar’s manufacturing plants have been focused on their lean transformation for the past several years and this is another way that they are improving lean processes in the plant. “This is one of the many initiatives we are doing to make manufacturing more effective at Navistar,” said Mark. Negotiations with Navistar and the United Automobile Workers Local 5010 at the IC Bus Plant in Tulsa, Oklahoma are now underway. Check this site frequently to read about the progress. About 700 workers at Navistar’s Tulsa Bus Plant are represented by the contract. Navistar and the UAW have reached a tentative six-year collective bargaining agreement. No details of the tentative agreement will be communicated publicly prior to the ratification vote, which will take place on December 16, 2018. We are confident that this agreement will help us work as a team to competitively build our vehicles, run our plants and win in the market. Rodney Tharp began as the Tulsa Bus Plant manager in the beginning of September. Rodney has worked at Navistar for about 19 years serving in several roles including manager of the former Conway Assembly Plant and most recently as Navistar’s supply chain director. He is now applying his years of bus manufacturing knowledge to his new role in Tulsa. We recently had the opportunity to sit down with Rodney and learn about his background, why he is passionate about building buses and his goals for the plant. You’ve worked at Navistar for several years and in many positions. What makes you excited about leading the Tulsa Bus Plant? I love the people and the product. People say that once you get in the bus business you bleed yellow. There is something very special about building a product that enables education and protects our children. We take safety and quality extremely seriously because we know that our vehicles carry children all over the country and the world. Parents allow us to carry their kids with confidence every day! They know we give them a product to get to school and back home safe. I also love the ability to influence a team. I believe in practicing servant leadership – my main goal is to serve my team. We are survivors here at Navistar. We all work hard and do our part toward success, I am so proud to be a part of it and I know that our trucks and buses are built by the best group of people in the world. What are your goals for the Tulsa Bus Plant? I’m still learning our opportunities, but I know that first and foremost, I want to deliver a product that is better. I’m focused on improving our ability to give our customer’s a product that sells itself. At a plant level, I’d like to see continued success through high and low seasons. We should never feel victimized, but always empowered to perform. I believe that with teamwork, the right expectations and right tools our performance will fall in place naturally. What is your favorite part of the role so far? My favorite part of this job is watching this team be successful. The energy is changing at our Tulsa facility. We are having fun celebrating successes. The activity committee is back engaged at the plant from both a union and plant perspective. We are bringing passion and energy to let our plant employees know that we all, as a team, are good at what we do. I start my day out on the floor, end my day out on the floor and rotate between groups. Watching people, who have very clear expectations and tools, turn their metrics green is rewarding for everyone. If we are struggling, we find out why we can’t be successful, ask what’s keeping us from making this green – and how can we help. We empower each other to always look for opportunities to improve safety, people, quality, delivery and cost. When my head hits the pillow, I really enjoy that we have employees that all row the boat the same direction. 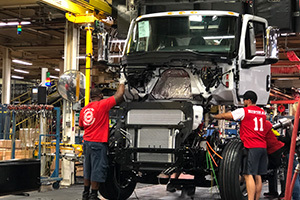 Navistar offered a proposal for a new six-year Navistar-UAW Collective Bargaining Agreement on November 26, 2018. The ratification vote took place on December 2, 2018 and the membership voted to reject the terms of the proposed agreement. We are disappointed in this decision and do not believe it is in the best interest for any of the involved parties. By its terms, the company’s proposal expires if it is not ratified and accepted by the union membership by December 10, 2018. Navistar continues to be committed to working with the UAW on solutions, and to reaching an agreement that helps all employees work as a team to competitively build our vehicles, run our plants and win in the market.